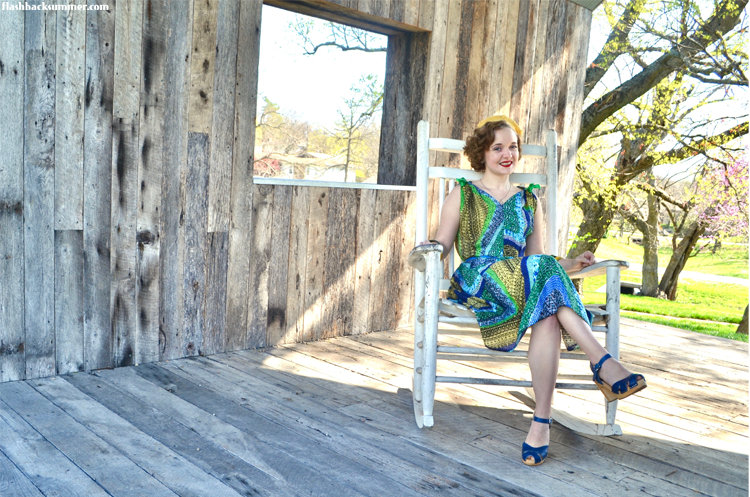 It's also FINALLY starting to sort of feel like spring in Missouri, so I'm sewing in anticipation of warm weather! I realized I have very little in the way of hot-weather clothing, particularly pieces that are quick to thrown on, comfortable, and un-fussy. To me, comfy-cute sundresses are great in the summer. The benefit of a dress is that it's a ready-to-go outfit all in one piece, then I just have to find accessories to complete it. They're also often cooler and breezier in hot weather than shorts or tucked-in shirts. 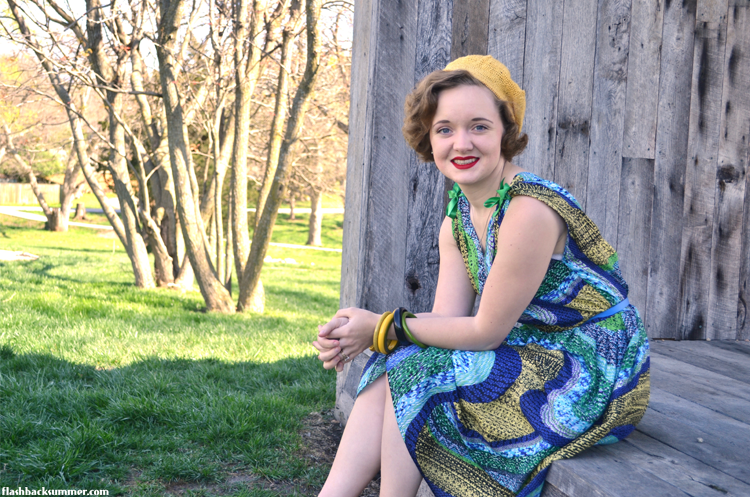 I pulled out this fabric to try out this easy, three-piece 1950s pattern, Advance 5627. (And the skirt is a rectangle, so I pretty much consider this a two-piece pattern.) The blousey silhouette means I didn't feel nervous about the fit and just went for it after some initial pattern piece measurements. I may bring it in a couple inches below the bust and at the waist next time, but I'm still quite happy with this version. I used rayon fabric from Ethiopia, specifically from the Harari people. My mother got it for me on a trip (as is her practice and I totally benefit) along with some other fabrics you'll see on the blog soon. 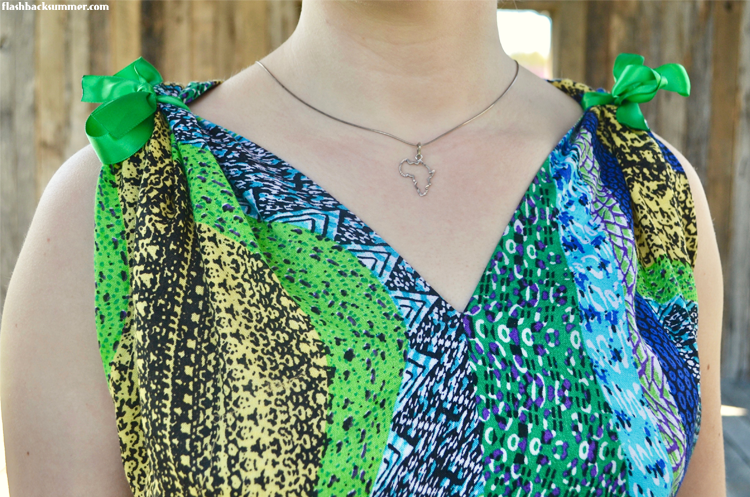 Ethiopia has a lot of gorgeous, light fabrics perfect for hot weather. You may even be surprised at some of the prints as they don't look "ethnic" to most of us in the U.S. on first glance. 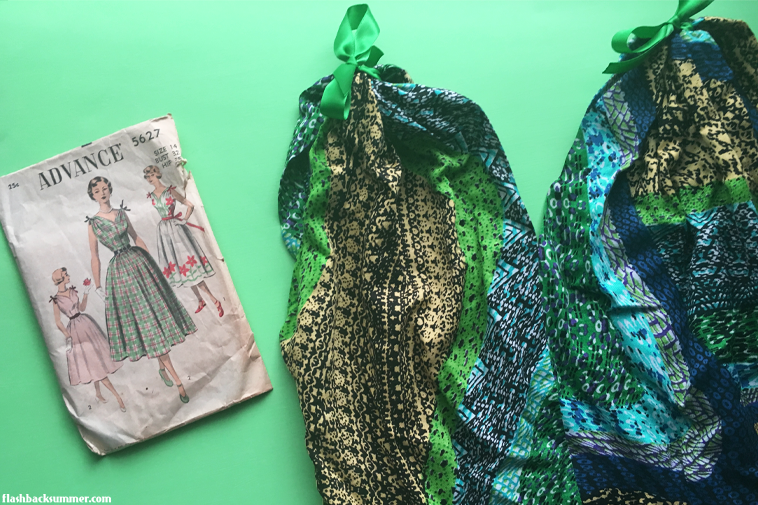 Harari fabrics tend to resemble a lot of our graphic prints used on summer maxi dresses and knits. 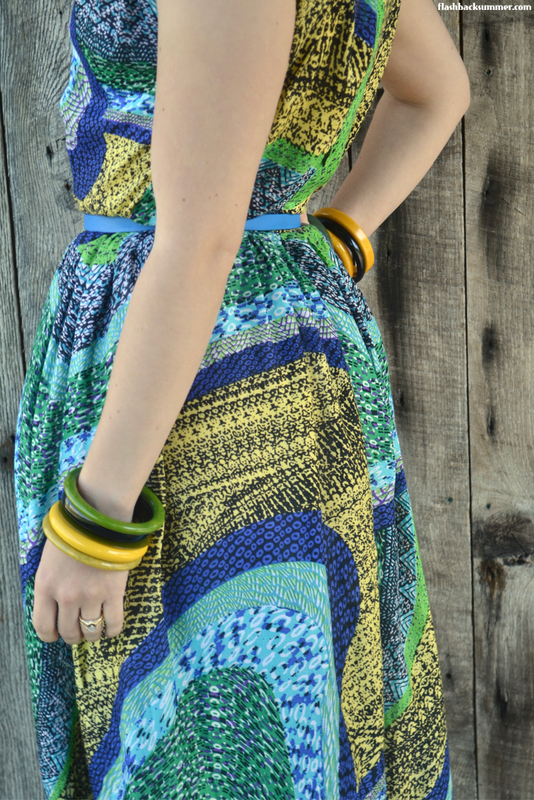 They're generally bright, bold, and have really vibrant prints. They also have a lot of rayons, a fabric you don't see much in other parts of Africa where cotton tends to dominate. I love the giant, swirling print on this fabric. 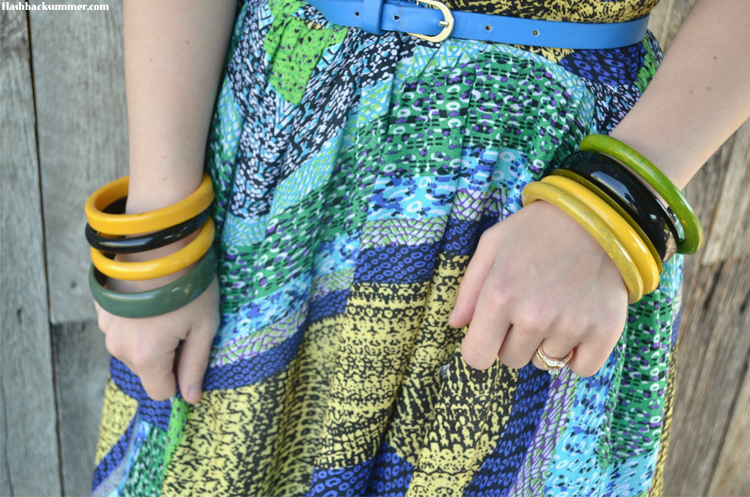 While I don't normally wear greens and yellows, I actually quite like it here in combination with the blues. The bodice is gathered up by ribbons at the shoulders. I sewed the green ribbons to the shoulder seams at the underside (just tacked them). I tacked them slightly outside of the center of the shoulder pieces so I can tie them around my bra and slip straps to keep everything hidden. I also love the neckline as it's classy and doesn't dip down impractically far while also flattering my round face and narrow shoulders. There is a zipper at the center back, and the skirt is just a dirndl style. I'm definitely going to be making this pattern again! While it's a 1950s pattern, the silhouette is so classic and timeless. 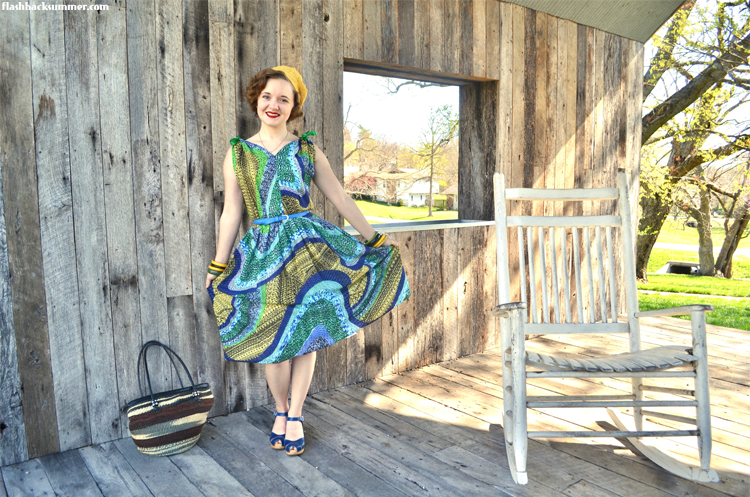 I look forward to making this pattern again and wearing this dress a lot this summer! 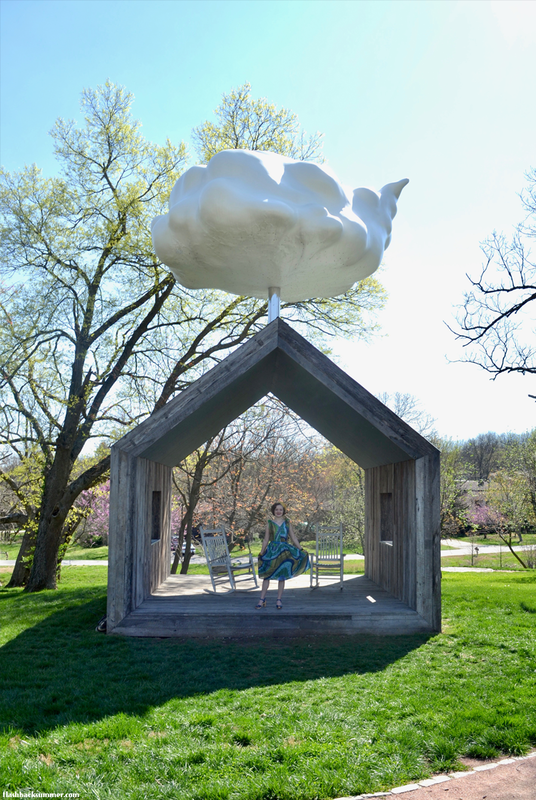 I think it looked great in this whimsical little cloud-house in my town, too. Both are a random, fun thing for summer! Do you have a summer silhouette you especially love? Are there any colors you don't normally wear but don't mind in certain pieces you own? I love everything about this dress! I have the same pattern and haven't had a chance to make it up yet! Now I really want to get to it...as soon as the baby comes! Do you think I could get away with moving the zip to the center front, for ease of nursing? Yes I do! The zipper doesn't go all the way to the top on the pattern, but the front is made in two pieces, so it would be easy insert one at the seam. Great idea! Very cute dress- and I can't believe it is only 2 pieces too! Beautiful fabric and pattern! A match made in heaven. I think the colours really suit you. Very cute and comfy! I love blues and greens, and I think the colors look smashing on you. The little ribbons at the shoulders are an adorable touch, and I like how they bring even more attentions up to your face. Aw, thank you! I don't usually feel like I can pull off yellow and green well, but you make me feel better about it! Such a pretty sundress. 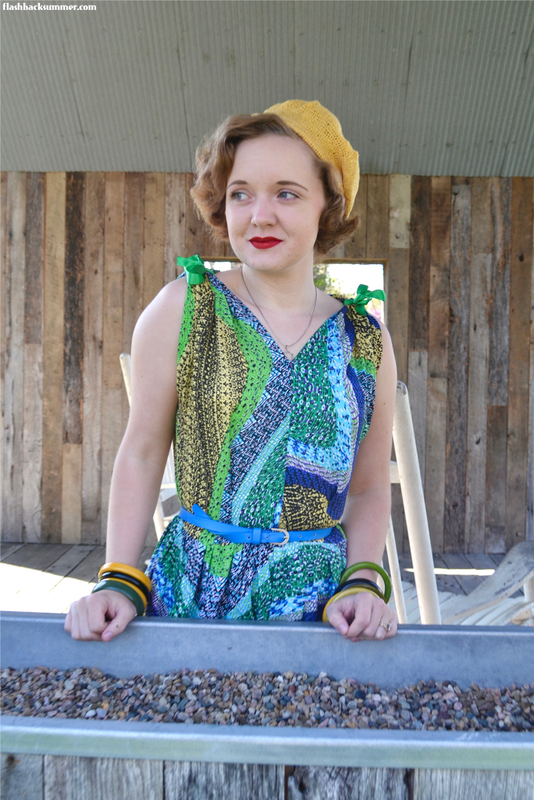 I find sundresses such a pleasure to sew, with the fun prints and often simple construction. And of course a pleaseure to wear too. There is something mindless about wearing one because you can just pull it on, and even with minimal accessories it looks put together and cute. 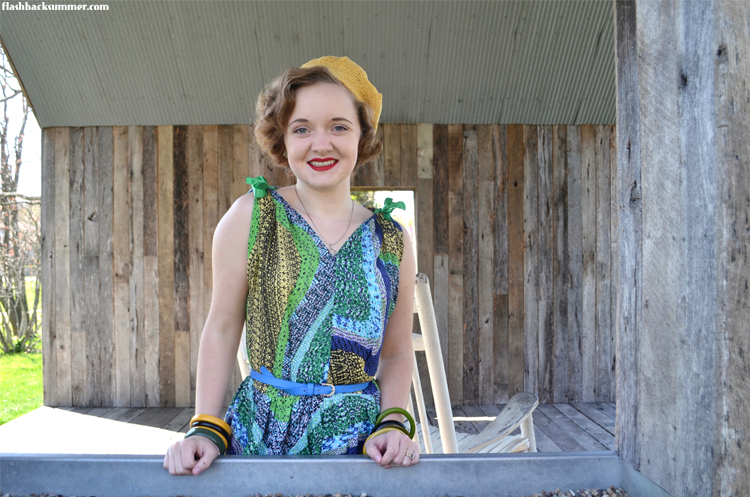 Love the print and colours of this little number! SO true! That's why I love sundresses too. They're just so easy and cute! This is a lovely outfit. 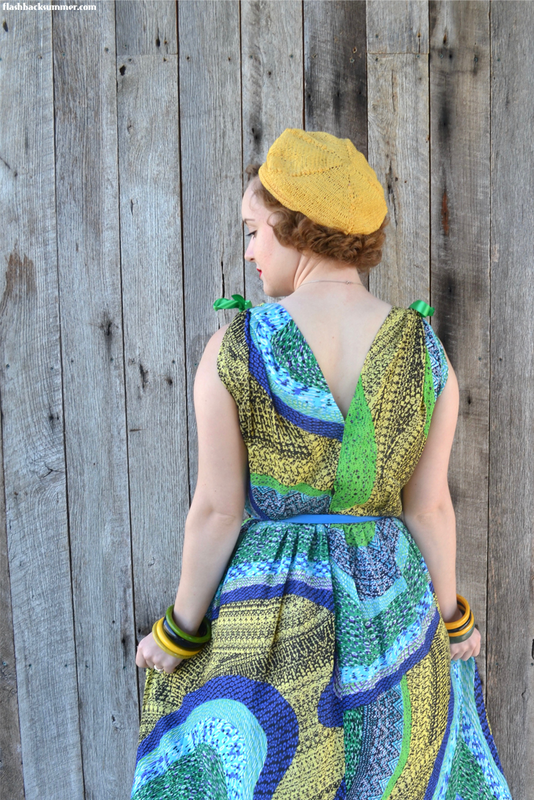 The print and colours are gorgeous and it looks like a super style for warm weather. Love the matching hat too.